Aki trained with Connacht in Galway yesterday. 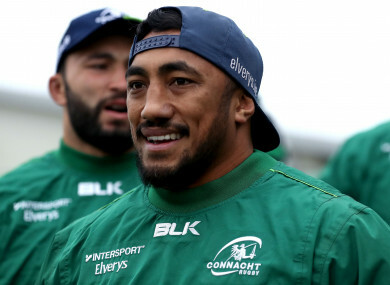 CONNACHT’S HOPES OF getting their European Challenge Cup campaign back on track have been boosted by the news that Bundee Aki will be available to play when Perpignan visit the Sportsground on Saturday. The Irish international is due to head to New Zealand for his wedding but Connacht coach Andy Friend confirmed yesterday that Aki will be available for Saturday’s round three clash in Galway. “He was really keen to come over on tour but we had Kyle Godwin and Tom Farrell who were doing very well,” said Friend. The Connacht coach confirmed that Ireland scrum-half Kieran Marmion has undergone ankle surgery which will keep him out of action until February. And winger Niyi Adeolokun could also be set for a lengthy spell on the sideline after picking up an arm injury on the tour to South Africa. He is waiting the results of a scan to establish the extent of the injury. Connacht need to pick up wins against Perpignan in the December back-to-back games to revive their chances of advancing through to the knockout stages, after defeat to Sale Sharks in round two. That loss means Connacht are currently six points adrift of the Premiership club in Pool 3, with Bordeaux and Perpignan two points further behind on two apiece. But Friend said confidence is high after a successful South African tour which saw the province record wins over the Southern Kings and the Cheetahs. “We will know more after these next two weeks,” he continued. “We want to win these next two games. That gives us the opportunity then to take stock and see what we want to do. “We want to keep winning and that’s why we are here. I see it as more of an opportunity to give players who didn’t come away with us on the trip, we had four internationals, we know Kieran Marmion is out with his ankle injury but we know Finlay Bealham, Quinn Roux and Bundee Aki didn’t tour with us. “For our blokes to have those results over there without them is brilliant. Now we want to give them blokes a chance to integrate back in. I see these next two weeks as a great opportunity to integrate the touring squad and the team that didn’t tour. “It’s starting to build some real depth there. We haven’t used them over the last few weeks but the team keeps winning. That’s what you want, in a quality side you want that competition. Email “Aki set for surprise Connacht return as Friend's men turn attention to Europe”. Feedback on “Aki set for surprise Connacht return as Friend's men turn attention to Europe”.